The vision God gave me in 1985 did not begin as a vision for a church. The vision that was planted deep within my spirit was and still is2014-04-17 13.29.42 centered in a commitment to God’s purpose and plan, no matter the cost. It was during the year of 1985 that God spoke to me of a hopeless state of mankind outside a relationship with Him. I had long ago surrendered my life to His will, so that was not the issue, but He was revealing to me the necessity for having greater intensity for Him, His Word, Will and Purpose. Early one morning, I shared with my roommate that I was going to take a walk. At the time we were living near the Santa Monica/West Los Angeles border just east of the 405, at the 10 freeway. I had gotten up one Saturday morning and walked for approximately three hours, seeking God and His direction from my life. I started out at about 4:30 and was completely unprepared for what happened next. I turn the corner heading back home. I found myself in the midst of a group of people who seemed, to number, in the hundreds. They all wore long gowns in various colors and were moving back and forth, what happened to be a prayer. The thing that arrested my attention was the fact that they moved around in complete silence. I stood there, in the mist for a while, watching them, (they didn’t even appear to notice me). No one said a word or acknowledge me with a smile or eye contact. It was just than that I ask God, what was I to make of this? He revealed to my spirit that all these people are searching for the meaning of their existence. It was just then that a bell rang, and they begin to move around at their previous speeds, shouting and singing to a foreign god. God spoke to my heart, that their state of condition is hopeless outside of a relationship with Him. Oh, I forgot to tell you the reason for my early walk, it was nervousness about “The Call”. God had informed me earlier in the week that I was to preach His Word and that it was to start this particular Saturday. So, I made my way back to the apartment, recalling the things I had seen. As the time drew near for my first official preaching opportunity, I began to think of all the locations to begin a preaching ministry. I would have NEVER chosen the spot God had in mind for me, the corner of Broadway and Manchester, in the heart of Watts (a.k.a., South Central, Los Angeles). I thought, God is this some kind of joke? (knowing in my heart He was right). What about Santa Monica? Now that’s a spot! I even begin to quote scriptures (His Word), to Him. Lord You’re…“not a respecter of persons”. So how about the Miracle Mile near Beverly Hills? My selfish thoughts were useless since I had committed to His Word, Plan and Purpose for my life. My roommate and I drove to the street corner of Watson, arriving 10 minutes before my starting time. You see God spoke to my heart to start at 12 noon for at least an hour. The message I shared was the same for two and a half years every Saturday, without fail. The scripture was John 3:16, rang out like clockwork! He never disappointed me, no not ONCE! The fear (God didn’t give it to me of that I was sure), I had and I do mean fear, was of the “Crips and Bloods”. I was called to their backyard, this rookie preacher with a shirt and tie and tracks to hand out to the lost. They were occasions when I would be preaching and the gang members would drive by and stare at me, and turned down there music. It was awesome! Although one try to splash curb water on me after rain had built up from a previous night’s rain; but I saw him coming and I jumped out of the way just in time (as he and I both smiled as he passed by). There were a number of people saved on that corner, and I continue to be grateful that He allowed me to be a part of it. I do want to share with you one occasion. I was preaching “for God so loved the world that He gave His only begotten Son”…and this woman came up to me and just waited until I took a breath. Standing behind her with a baby in a stroller was a man, later identified as her husband. He was standing there with a brown paper bag in his hand, clutching it ever so tightly. She motioned to him to come closer, at which point he asked me if I was a preacher. And his wife, with a look of disbelief said “Just look at him! Can’t you tell he’s a man of God”! As he was putting his head down, I asked if he wanted something and he said, “Jesus. But He won’t take me in my condition”, pointing to his bag which contained beer. I seized the door of opportunity God had opened and began to share Jesus into his heart as his Lord and Savior. Oh!!! What a day that was…the man’s wife, already a believer, hug me, and the three of them walked down the street rejoicing. Well after two and one-half years were up, I was blessed with a job traveling as an auditor around the world. It was at this job (headquarters office), that God revealed two important aspects of my next ministry assignment. I was traveling to places like Paris France, London England, twice a year as well as extensively throughout the United States, Manhattan, Chicago, Denver, and Tampa. You name it I’ve visited spots. The strangest thing happened though while in Paris, instead of visiting the world renown landmarks, I was in my room crying of the burden for the lost in the city, I happen to be visiting at the time. I knew in my spirit that God was intensifying the call to full time ministry. Showing me what was truly important (of lasting value). We found a place to hold services after much prayer, that little unknown but very nice hotel in Ontario, California, We remained there for 7 months, until one Friday evening we were notified by phone that this hotel was in process of being sold to a major chain. We had one week to find another place to hold services, since the new owner’s didn’t want any church holdings services in their building. God performed a miracle. There were four small churches looking for a larger place to hold services and we were the fifth to find out about it. The Word says, “the last will be first”, I know that to be a fact, because the church that was last (FAITH Walk), was given the building. None of the other churches could qualify!!! Praise God! Tribulations we’ve experienced, but God has ALWAYS provided. We continue to be committed without compromise. What God has called us to do is far from completion. We have not arrived. We have only begun. We refuse to be left behind, and I am just as committed today as I was that cold Saturday morning, I mention to you earlier. 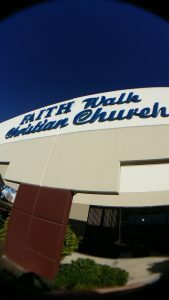 Whatever He wanted of me, of this church, called FAITH Walk – He will receive!!! The reason is simple: It’s His Church! 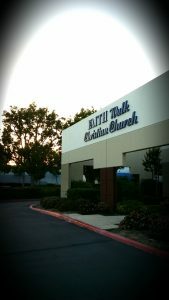 This church is and will remain “Jesus Christ Centered – Holy Spirit Led”. No weapon formed against her / us will prosper!! !